Back in the 80s, the United States Navy wanted a stealth aircraft to replace the A-6 Intruder. McDonnell Douglas and General Dynamics came up with an ultra-secret flying wing design, an alien-looking aircraft called the A-12 Avenger II. It never flew. Fast forward 30 years and go to eBay. Someone named Seth Kettleman is selling its canopy for a whooping $620,238. How did this happen? The canopy has now been verified as authentic. It was a production unit for the A-12 Avenger II manufactured by McAir (Division of McDonnell Douglas). The canopy must have a hundred or so individual serial numbers and manufacturing data marked on it. These numbers and individual pieces have been verified as authentic parts from the program. How did this man get his hands on a top secret part, the bloody entire canopy of a United States Navy secret plane? Did he steal it? Did he find it somewhere in the Nevada desert? And it was completely legal. Kettleman, who buys and sells aircraft parts on the web for collectors, found it on GovDeals, a web site that "provides services to various government agencies that allow them to sell surplus and confiscated items via the Internet." Apparently, someone in some Pentagon office thought it was safe to sell an entire canopy of a plane that was kept under top secret and never saw the light. Concept illustration showing three Avenger IIs after taking off from an aircraft carrier. A side view of the canopy from Kettleman's eBay page. 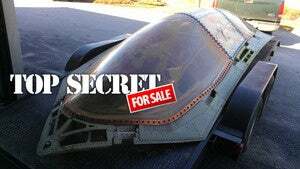 One of the images of the canopy from the GovDeals' auction page.